An international team of astrophysicists led by researchers at the Max Planck Institute for Astrophysics presents the worldwide largest simulation of the universe and an accurate theoretical model for the growth of galaxies and supermassive black holes. The Virgo consortium, an international group of astrophysicists from Germany, the UK, Canada and the USA has just released first results from the largest simulation ever of cosmic structure growth and of galaxy and quasar formation. This "Millennium Run" used more than 10 billion particles to trace the evolution of the matter distribution in a cubic region of the Universe over 2 billion light-years on a side. It kept busy the principal supercomputer at the Max Planck Society's Supercomputing Centre in Garching, Germany for more than a month. The Virgo consortium, an international group of astrophysicists from Germany, the UK, Canada and the USA has just released first results from the largest simulation ever of cosmic structure growth and of galaxy and quasar formation. 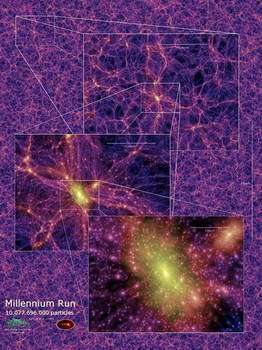 This "Millennium Run" used more than 10 billion particles to trace the evolution of the matter distribution in a cubic region of the Universe over 2 billion light-years on a side. It kept busy the principal supercomputer at the Max Planck Society's Supercomputing Centre in Garching, Germany for more than a month. By applying sophisticated modelling techniques to the 25 Tbytes of stored output, Virgo scientists are able recreate evolutionary histories both for the 20 million or so galaxies which populate this enormous volume and for the supermassive black holes which occasionally power quasars at their hearts. The Virgo article, published in the June 2 issue of Nature, shows how comparing such simulated data to large observational surveys can clarify the physical processes underlying the buildup of real galaxies and black holes. Recent advances in cosmology appear to demonstrate that about 70 percent of our Universe currently consists of Dark Energy, a mysterious force field which is causing it to expand ever more rapidly. About one quarter apparently consists of Cold Dark Matter, a new kind of elementary particle not yet directly detected on Earth. Only about 5 percent is made out of the ordinary atomic matter we are familiar with, most of that consisting of hydrogen and helium. Telescopes sensitive to microwaves have been able to image the Universe directly when it was only 400,000 years old. The only structure at that time was weak ripples in an otherwise uniform sea of matter and radiation. Gravitationally driven evolution later turned these ripples into the enormously rich structure we see today. It is this growth which the Millennium Run is designed to follow, with the twin goals of checking that this new paradigm for cosmic evolution is indeed consistent with what we see, and of exploring the complex physics which gave rise to galaxies and their central black holes. In their Nature article the Virgo scientists use the Millennium Run to study the early growth of black holes. The Sloan Digital Sky Survey (SDSS) discovered a number of very distant and very bright quasars which appear to host black holes at least a billion times more massive than the Sun at a time when the Universe was less than a tenth its present age. "Many astronomers thought this impossible to reconcile with the gradual growth of structure predicted by the standard picture", says Volker Springel (Max Planck Institute for Astrophysics, Garching) the leader of the Millennium project and the first author of the article, "yet when we tried out our galaxy and quasar formation modelling we found that a few massive black holes do form early enough to account for these very rare SDSS quasars. Their galaxy hosts first appear in the Millennium Run when the Universe is only a few hundred million years old, and by the present day they have become the most massive galaxies at the centres of the biggest galaxy clusters." For Carlos Frenk (Institute for Computational Cosmology, Durham) the head of Virgo in the UK, the most interesting aspect of the preliminary results is the fact that the Millennium Run demonstrates for the first time that the characteristic patterns imprinted on the matter distribution at early epochs and visible directly in the microwave maps, should still be present and should be detectable in the observed distribution of galaxies. "If we can measure the baryon wiggles sufficiently well", says Frenk, "then they will provide us with a standard measuring rod to characterise the geometry and expansion history of the universe and so to learn about the nature of the Dark Energy." The most interesting and far-reaching applications of the Millennium Run are still to come according to Simon White (Max Planck Institute for Astrophysics) who heads Virgo efforts in Germany. "New observational campaigns are providing us with information of unprecedented precision about the properties of galaxies, black holes and the large-scale structure of our Universe," he notes. "Our ability to predict the consequences of our theories must reach a matching level of precision if we are to use these surveys effectively to learn about the origin and nature of our world. The Millennium Run is a unique tool for this. Our biggest challenge now is to make its power available to astronomers everywhere so that they can insert their own galaxy and quasar formation modelling in order to interpret their own observational surveys." 1. A 3-dimensional visualization of the Millennium Simulation. The movie shows a journey through the simulated universe. On the way, we visit a rich cluster of galaxies and fly around it. During the two minutes of the movie, we travel a distance for which light would need more than 2.4 billion years. 2. This movie shows the dark matter distribution in the universe at the present time, based on the Millennium Simulation, the largest N-body simulation carried out thus far (more than 1010 particles). By zooming in on a massive cluster of galaxies, the movie highlights the morphology of the structure on different scales, and the large dynamic range of the simulation (105 per dimension in 3D). The zoom extends from scales of several Gpc down to resolved substructures as small as ~10 kpc.